Maybe you work with a remote team around the world. Or, maybe you just want to chat quickly with a coworker while you are traveling. Either way, team communication apps mean that you can stay in touch no matter where you work or where you go. 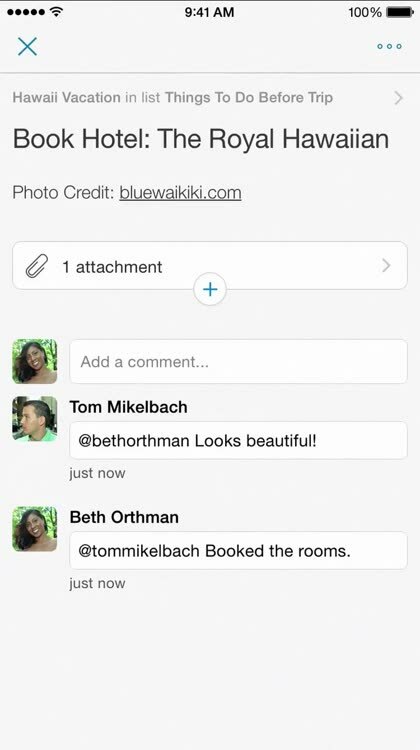 Talk with your team, share files and photos, and create custom chat channels. For those who need a team communication tool that offers file sharing. 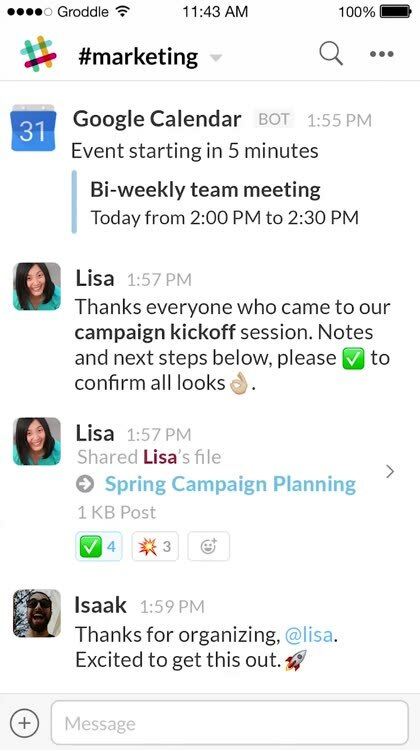 For a great way to communicate with your team, check out Slack. With real-time messaging and file sharing, you can instantly collaborate with team members and coworkers. 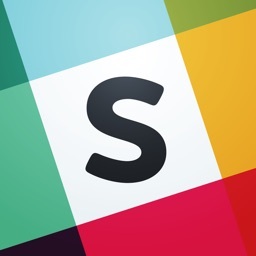 Slack syncs across devices and can be accessed via the Web. There are additional useful features including search and archive, integrations with Dropbox, Twitter, and Google Drive, and configurable notifications so you never miss a thing. Slack is a vibrant team communication tool that allows for instant messaging and convenient collaboration. For those who want a team communication app with chat, video, and meeting capabilities. 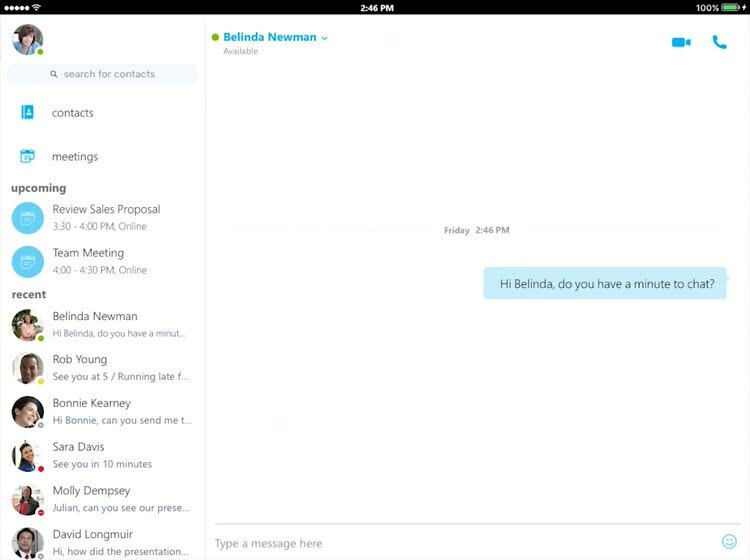 Skype for Business keeps you in touch with your team. Start a group chat or video conversation, create and control a business meeting, and invite participants easily. 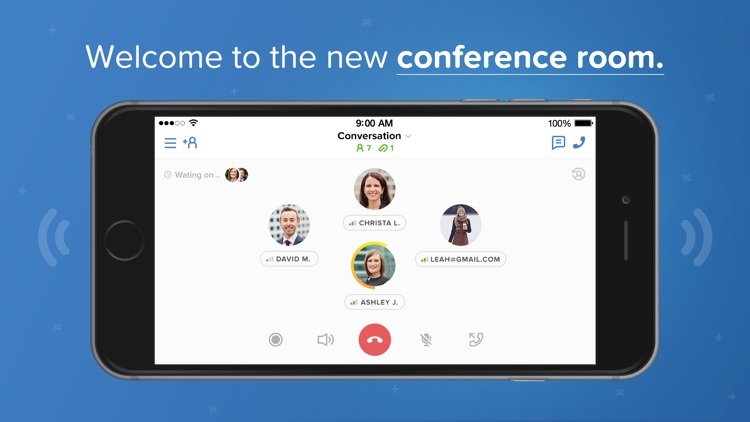 The app, formerly Lync 2013, lets anyone join a meeting by invitation. 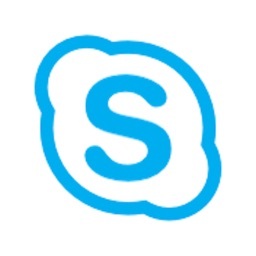 However, a Skype for Business or Lync account is necessary to enjoy all of the app’s features. Skype for Business offers a nice set of features for holding meetings and communicating with your team when you are away from the office. When you need to plan or join a meeting, but the participants cannot all be in the same room, check out these tools. You can get together face-to-face, talk and collaborate, and share files and presentations – all from your mobile device. For those who use Cisco WebEx and want to schedule and host meetings on-the-go. 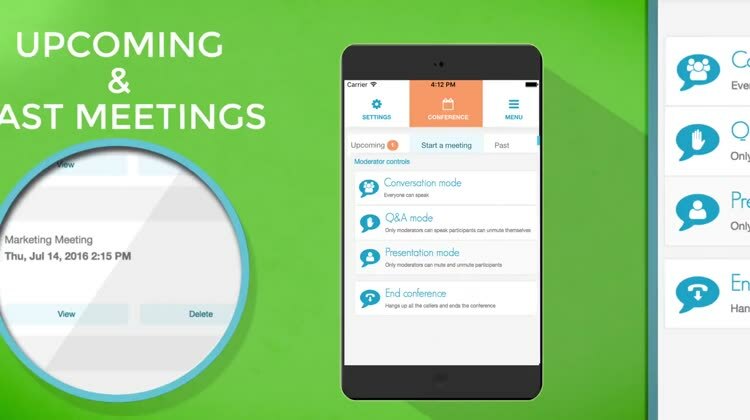 If you currently conduct meetings and calls with Cisco WebEx, then the Cisco WebEx Meetings app is essential. 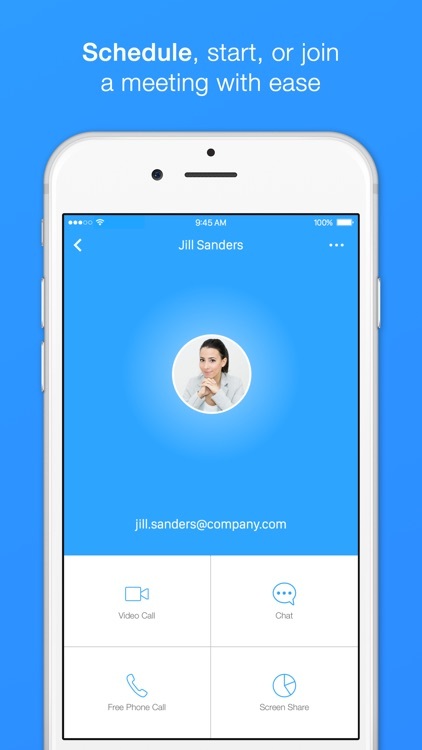 Share files and documents, record meetings, and initiate a private or group chat. 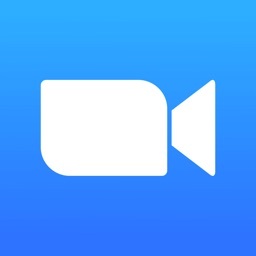 The app offers auto-connect audio, web conferencing, a 2-way video camera switcher, and Apple Watch support. Anyone can join a meeting, but keep in mind that scheduling or hosting on of your own requires a Cisco WebEx Host account. 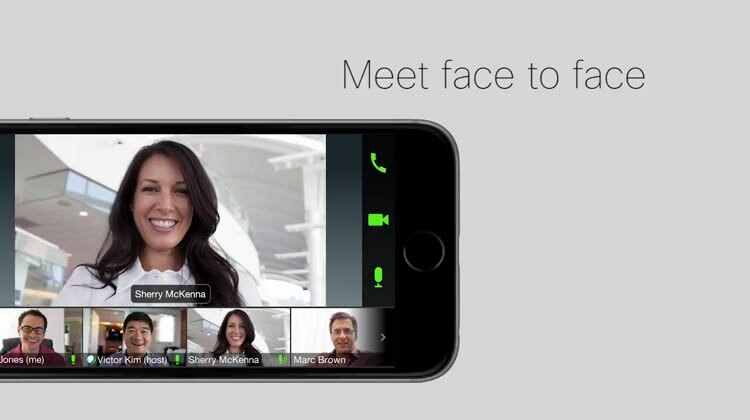 The Cisco WebEx Meetings app is the ideal accompaniment for those with an account. Schedule a meeting and display your presentation from anywhere. For those who want a meeting app with a safe driving mode. 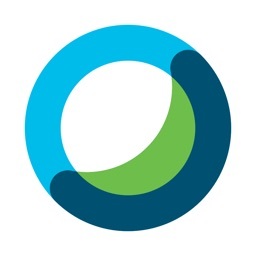 With Zoom Cloud Meetings, you can host or join meetings on your iPhone or iPad. 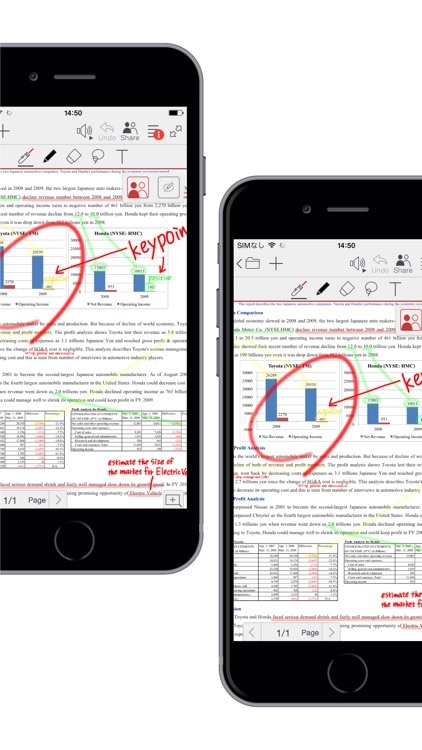 The app offers screen sharing, co-annotating, and real-time whiteboard collaboration on iPad. You can start a meeting with Siri and use the safe driving mode if you’re in the car. Zoom Cloud Meetings lets you host meetings with up to 100 people, so it’s ideal for meetings big or small. If you want to plan a conference call with your team or client and are away from your desk, here are the apps you need. With great features, ease-of-use, and clear communications, you are always just a phone call away. For those who want a conference call app with recurring calls, call history, and up to 400 callers. Free Conference Calls from FreeConference.com lets you schedule calls with up to 400 callers and create recurring calls for regular meetings. The app provides international dial-in numbers, chat, notes, and call history, plus an integrated address book. For a free conference call app with the features, you need, Free Conference Calls from FreeConference.com is a great option. Free Conference Calls from FreeConference.com lets you hold a call with hundreds of participants and offers notes and chat. For those who want a conference call app with file sharing, local numbers, and group chat. 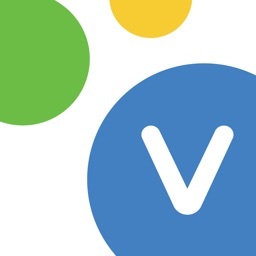 Voxeet Conference Call offers a variety of features to keep your conference calls simple and effective. You can have up to eight participants, share files, use the group chat, and have local dial-in numbers. The Whisper mode is great for two-way conversations and the guest login is ideal for a quick call. 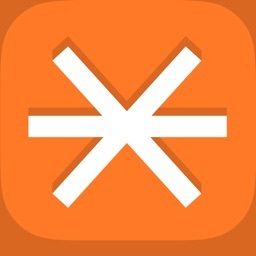 For an easy-to-use conference call app with a good array of features, check out Voxeet Conference Call. No matter what type of document you need to collaborate on, be sure you have an app for it. Open the files, share them, make annotations, and collaborate with your team using these handy office tools. For those who want an office documents app with collaboration, device syncing, and PDF support. With Polaris Office, you can open a variety of file formats including Microsoft Office and PDF files. Draw, edit, and make comments for your collaborators. You can also insert photos and videos, take advantage of the handy search feature, and use the app on both iPhone and iPad with device syncing. For a simple way to collaborate on documents and make notes for yourself, Polaris Office is an intuitive tool. 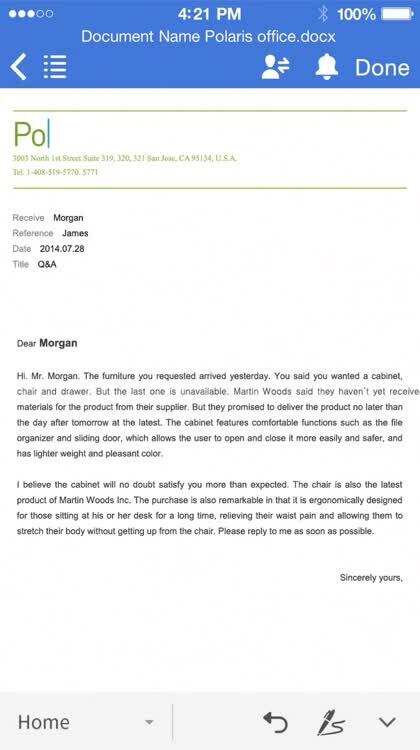 For those who often work with others when it comes to creating documents and spreadsheets. Quip is a sleek app that gives users the ability to collaborate with others on documents, spreadsheets, and even to-do lists. It is super easy to create a new document and invite others to make changes to it as well. All changes and annotations will be reflected in real-time and saved automatically, so you don’t miss a beat. There is a full chat function in Quip so you can contact other members about changes that you may have questions about, or just want to comment on what they did. 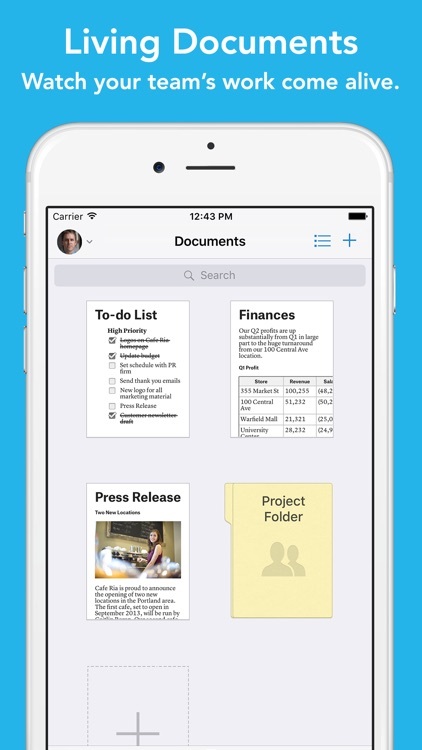 All documents made in Quip can be exported out to other apps like Dropbox, Evernote, Google Drive, and more. Or, you can opt for traditional methods like PDF and Microsoft Office. 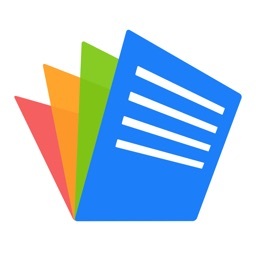 If you deal heavily with collaborative work on documents and spreadsheets, Quip is definitely worth checking out. 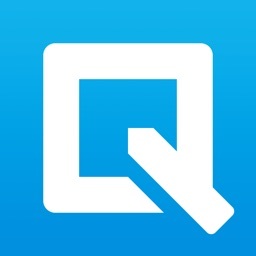 Quip has a slick interface and is intuitive to use. It also includes all of the powerful features that you’d expect from a word processing app and there are plenty of ways to get your data in or out if need be. Maybe it isn’t documents you need to collaborate on, but notes. If you all attended a seminar, meeting, or conference together, you may have to compare and combine everyone’s notes. And, these apps make it easy. 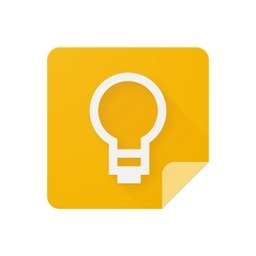 For anyone who’s reliant on Google services and wants to use it for their note-taking needs as well. 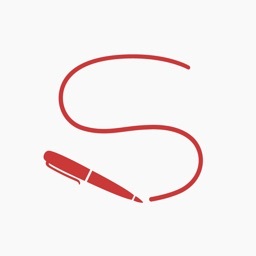 If you are dependent on Google services, then Keep is the perfect note-taking app for you. Keep lets users keep an infinite amount of notes in their account and all of your data is easily accessible through Google’s cloud, so you can get to your notes no matter what computer or mobile device you are using. With Keep, you can even set reminders if needed on important notes, and you can share your notes and lists with friends and family. 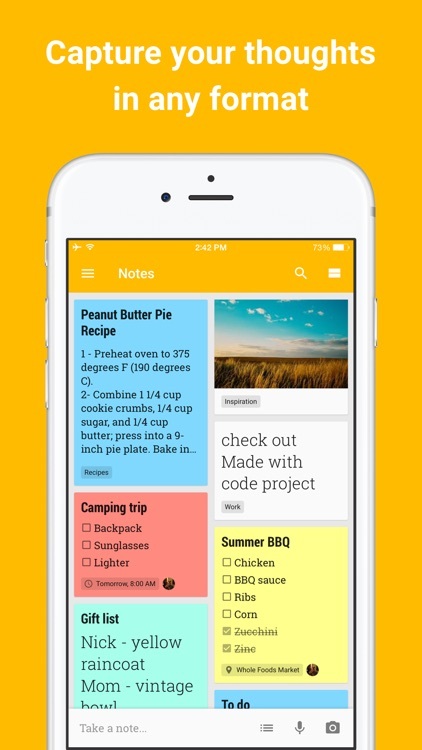 The app also supports photos and audio files in your notes, so no matter what you need to keep a note of, Keep has you covered. Google is integrated into a lot of our daily lives, so Keep is a no-brainer when it comes to nicely synced notes that can be accessed no matter what platform you are on. For those who want a whiteboard collaboration tool with real-time interaction. If you and your team are in the market for a digital whiteboard for collaboration, check out MetaMoJi Share Lite. The app offers real-time interaction, live meeting features, team communication, and collaborate on notes with comments and corrections together. The paid version of the app allows you to record audio for your sessions, which is a great feature. MetaMoJi Share Lite provides a simple way to interact and collaborate with your team using a virtual whiteboard. If there is one business item that usually requires collaboration, it’s a project. These terrific apps not only let you collaborate with your team, but manage the projects and tasks at the same time. For those who want a collaborative task and project app with time tracking and automated workflows. 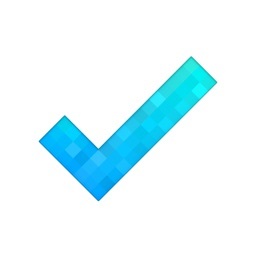 MeisterTask is a terrific tool and broadly accessible, making it a flexible choice. Using the Kanban method, you can create unlimited projects, set up agile workflows, and view activity streams for all items. The app offers real-time collaboration across devices, notifications, commenting, linking, checklists, and time tracking. You can also automate your workflow with Section Actions. For a tool you and your team can access from your mobile device as well as the web, MeisterTask offers great features and easy collaboration. With this full-featured, visual tool, you can manage your projects with ease. For those who like to use the Kanban method for managing their projects. 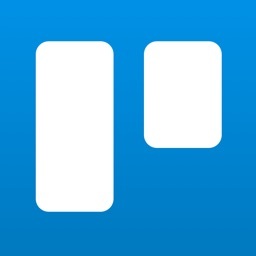 For an all-encompassing project app, Trello offers many useful features. Create a board, add a list, and then pop in cards that can contain tasks, files, photos, and checklists. 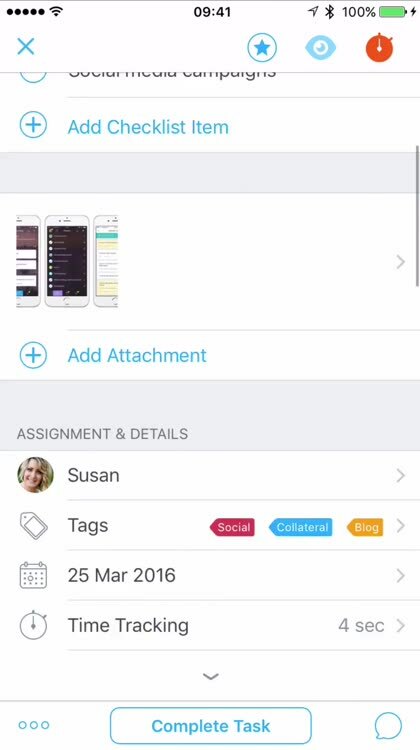 You can assign items to others, receive notifications, comment on cards for collaboration, and much more. Trello can be accessed via the Web and is available across multiple devices and platforms, so you can keep up with projects from anywhere. Trello is a wonderful project management app that uses the Kanban method. With the right features to create, maintain, assign, and keep track, you cannot go wrong with Trello. Previous articleDoes Cucumber JS support "And"?